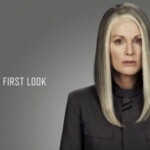 Award winning actor Julianne Moore appears in the first official images released from the film set of the Hunger Games: Mockingjay (Part One). 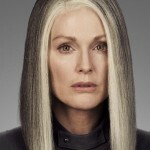 Moore plays the president of District 13 called Alma Coin. 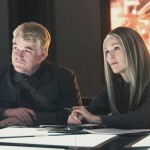 She forms an alliance with Katniss after rescuing her from the Champion of Champions event which is the 75th Hunger Games. The image shows Moore replacing her usual red locks with grey instead giving her an air of authority.